If you have Nokia multimedia mobile phone, you can enjoy Youtube or any live streaming videos like live tv on your Nokia mobile phone. For you to achieve it, all you need to do is to configure your mobile for streaming videos. If you try to run Youtube videos on your Nokia mobile phone without configuring your streaming setting, it will not work, you will get this message from media player 'Operation failed'. 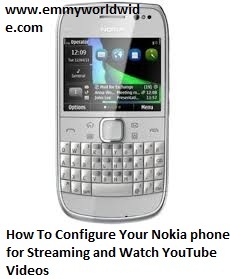 So here is step by step procedure to configure your Nokia mobile phone for Youtube videos. Note: This setting work both on s40 and s60 Nokia phone. Read and apply it to your phone. Step 1: Open Menu >> Go to Settings >> Configuration >> select personal configuration >> Select Options >> Add New and Select Streaming. If you have not configured your phone for internet browsing, read this post on how to configure your phone for internet browsing, all network. Now click back, and select stream and activate it using Option. 1. Go to RealPlayer and select Options > Settings > Streaming > Proxy or Network. 2. To define access point select Network > Default access point or the one you created. Read: How to configure/create all network Access Point (APN) for your phone internet browsing. Note: If your service provider use proxy server to speed up access to web pages that contain media files, select Proxy > Yes and insert the working IP address and port number of the proxy server. This is all you need to set up in your mobile phone. Now open Youtube.com, browse select and play any video and enjoy. Feel free to share with us other ways you know, using the comment box below and kindly share this post with your friends and tell your friends to share it with their friends.